When it comes to losing weight, cardiovascular exercise is an essential factor that plays into your success. Without cardio, losing weight will take much longer. While strength training helps you get toned, cardio burns fat quickly. Running is an excellent form of cardio that you can begin through your neighborhood, in the park, or at the gym. The following running program helps you get started gradually and work your way up. Instead of uncomfortably forcing yourself to go long distances, this program eases you in at your own pace. Understand that beyond burning fat, running improves your cardiovascular health and boosts your mood. In fact, running increases levels of serotonin, a neurotransmitter that promotes contentment. It's also important to get good sneakers to minimize impact and ensure your foot is comfortable, thereby protecting your whole body. A good pair of running shoes should have room for your toes to wiggle. Start the first week off with a lot of walking. This gets you used to a routine and is a great way to develop a daily discipline. The first week, try walking briskly 20 - 30 minutes for five days of the week. You can make it fun and increase encouragement by starting off with a friend if you'd like, as it's a great way to catch up and keep a positive attitude. After you run or walk, you should do 5 - 10 minutes of stretching to cool down. Stretching is essential to gain flexibility and improve range of motion. This can prevent injuries to the ankles, knees, calves, thighs, and hips. After your run, a good stretch can ease tense muscles and minimize soreness. Also, make sure that as you run, your shoulders and jaw do not become tense. Keep breathing deeply and remain relaxed. Weeks 2 and 3 should focus mostly on alternating between walking and running. Warm up by starting with a few minutes of walking. Then try walking for one minute and running for one minute, on and off for 10 minutes on Monday and Tuesday. Then, on the final three days, alternate two to three minutes of running with one minute of walking for 12 - 15 minutes. Don't worry about how far you're going - it's more about how you feel. 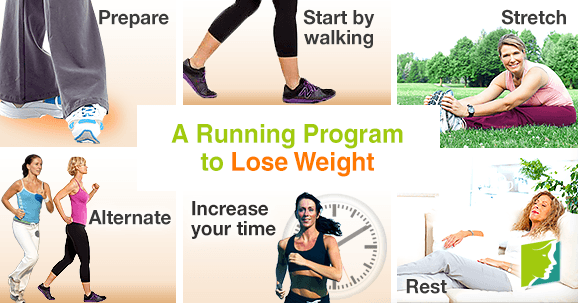 Weeks 4, 5, and onward continue the alternation between running and walking, but run for longer periods of time. Start running for eight minutes, then walking for three, then gradually work your way to 12, 18, 25, and 30 minutes at once. When running, you should be at a pace where you can keep up a conversation, but not sing a song. Choose two days a week to rest and reap the rewards of your run. Make sure to eat a balanced diet of whole grains, fruits, vegetables, and lean proteins to maximize the benefits. Though you may be eager to lose weight, it's important to have days of rest in order to give the muscles and other tissues time to repair themselves from the natural wear and tear of running and exercise. This running program sets realistic goals to help you get fit. It can be hard to begin, but if you ease yourself in, you'll be running for 30 consecutive minutes in five weeks or less. Find further ways to control your weight during menopause follow this link.